Vinery champion More Than Ready and his Group 1 winning sire-son Sebring set the pace after the first 100 yearlings changed hands on at the Magic Millions Sale on Wednesday. Sebring’s colt from Footprint (Lot 27) was sold by Musk Creek Farm to Hong Kong trainer Kwok Hing Hung Little. His dam is a half-sister to stakes winners Marching (G2 AAMI Vase) and Gait (LR Debutant Stakes). “We knew he was going to be popular half-way through prepping,” Musk Creek assistant-manager Jamee Ryder said. “He’s been out parading since we got here and has been very professional the whole way through. 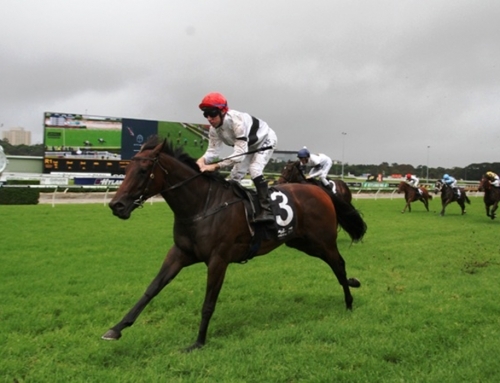 Musk Creek sold his older half-brother by Pierro for $105,000 at last year’s Magic Millions. Named Coutinho, he has impressed trainers Lee & Anthony Freedman while going through the system at Flemington. Musk Creek owner David Kobritz pin-hooked Pierro as a foal and he also purchased Footprint for $110,000 at Darley reduction sale in 2013. Not to be outdone by his son, More Than Ready weighed in with an eye-catching $600,000 filly from G3 Pimlico Miss Preakness Stakes winner Heart Ashley (Lot 80). She was sold by Kia-Ora Stud to Vinery Stud. Her older half-sister Ameristralia completed a hat-trick earlier this season for Spendthrift Stud. The Fastnet Rock mare was back in action with a promising first-up placing at Caulfield last Saturday. More Than Ready produced another high-ticket item on Monday afternoon when his filly from G2 Roman Consul Stakes winner Jolie Bay was knocked down for $310,000. She was purchased by Darby Racing who syndicated champion filly Yankee Rose for $10,000 two years ago.